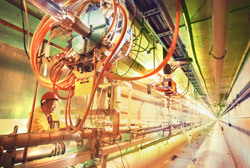 University faculty and students are involved in an exciting ATLAS research program at the Large Hadron Collider (LHC) of the European Organization for Nuclear Research (CERN) near Geneva, Switzerland. There are -10,000 scientists from -600 institutions of -100 countries currently doing their research at CERN. The 10 billion dollar LHC started collision in November 2009 and will remain as the world's most powerful collider until at least 2030 with great discovery potential. LHC has been one of the most ambitious and exciting scientific projects in human history. The ATLAS (A Ioroidal1HC ApparatuS) is a flagship LHC experiment designed to search for new physics. The ATLAS collaboration consists of -3000 physicists from -180 institutions of 37 countries all over the world. Among them there are -500 physicists from -40 prestigious U.S. universities (e.g. Harvard, Yale, MIT, Columbia, University of Chicago, UC-Berkeley, University of Michigan, University of Washington, etc.) and national labs (Argonne National Lab, Brookhaven National Lab, Lawrence Berkeley National Lab, and Stanford Linear Accelerator Center). Fresno State is the only CSU campus on ATLAS. This provides our students outstanding research opportunities, unique in the CSU system, at CERN for the next 20 years or longer. To provide the ATLASILHC research opportunity to a wider CSU community, we are building a CSU ATLAS Consortium. Nine other campuses (Dominguez Hills, Humboldt, Long Beach, Los Angeles, Pomona, Sacramento, San Bernardino, San Francisco, and Stanislaus) have joined the consortium. Since 2008, 13 CSU students (nine from Fresno, four from Long Beach and Sacramento), of which 11 are undergraduates, have worked on ATLAS research projects at CERN. In March 2010, NSF awarded Prof. Yongsheng Gao a two-year $620,000 Major Research Instrumentation (MRI) grant to set up ATLAS Grid Computing Tier 3 facilities at all the nine NSF funded institutions on ATLAS. We are setting up the facility at Fresno State to search for new physics with ATLAS data. The CSC is providing work space for students of the Fresno State ATLAS group and CSU ATLAS Consortium to work on ATLAS physics using the Fresno State Tier 3 facility to access the ATLAS data. The CSC is used for tutorials and training with ATLAS software and tools to analyze ATLAS data for CSU ATLAS Consortium students. The CSC allows our students to actively work on ATLAS physics without traveling to CERN. It serves as a bridge for our students to the world center of high-energy physics. A second instruction and research area is biomedical physics. Development of medical imaging equipment, as with much modem technology, is best achieved with the aid of extensive computer simulation. For projection X-ray, X-ray CT, and nuclear medicine imaging, Monte Carlo simulation is especially useful in determining the transport of photons from their source, through the patient, and through collimation and detection apparatus to give a pattern of energy depositions in the detector that is the basis for the eventual image. Although photon scattering and absorption are conceptually straightforward, the equations become intractable for multiple generations scattering distributions that change as a scattered photon loses energy. 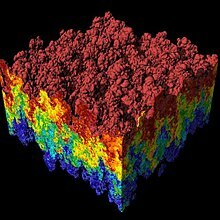 Monte Carlo modeling, however, is a straightforward, well-tested, and highly successful technique for understanding photon transport. Dr. Charles Tenney is investigating equipment designs for breast cancer detection through radiotracer imaging. Such systems are attracting interest for cases in which tumors are difficult to detect using X-ray mannnography. Although a workstation adequate for this type of simulation is available, there are cases in which greater simulation capability translates directly to better knowledge-the more situations can be effectively modeled, the more designs can be examined, and the more readily a design can be optimized. In addition, the computational power offered by the Computational Science Center will make it practical to consider using Monte Carlo models, as well as complex tomographic reconstruction software, in teaching X-ray physics and nuclear medicine physics classes in the Biomedical Physcis curriculum (PHYS 156 and PHYS 157 respectively).